The folks at Catskill are seriously environmentally friendly. When they make their astoundingly tough cutting boards, they ensure the wood they use is harvested from a non-endangered, self-sustaining source, and they also make sure no waste products are left over from the manufacturing process. Absolutely everything is recycled – even the sawdust – to create wooden fuel beads that the locals use to heat their homes in winter. Now that’s green thinking in action! Catskill Cutting Boards are friendly to more than just the environment, though: they’re also friendly to your knives. Wood doesn’t dull your blades, which is why all the best chopping boards are made from this natural material. Grandma’s Original Turkey Board is a cheeky addition to your kitchen, and will be a welcome sight when you’re next trying to carve up a big bird! 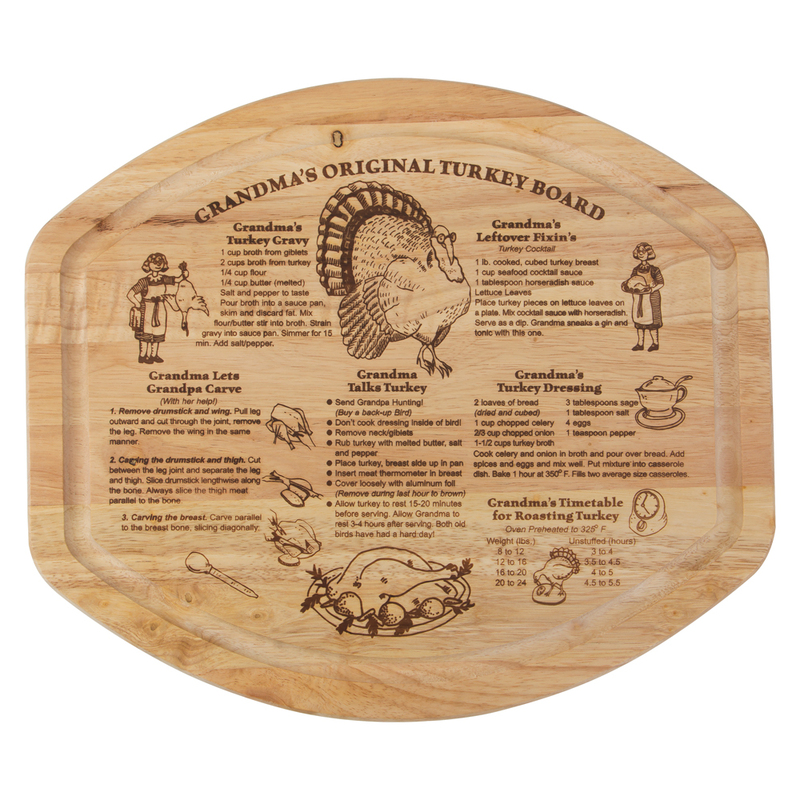 Decorated with grandma’s best turkey recipes, it also features a groove for catching juice while you carve. Get some skill in the kitchen. Catskill, that is! Made from ecologically sound rubberwood. Decorated with various recipes for turkey and its cooking time. Due to the natural antibacterial properties of wood, your Catskill chopping board only requires a quick wipe-down with a damp cloth, dish soap and water. Allow to air dry. It is not recommended that you fully submerge your Catskill board in water, as this may cause the wood to warp and crack once it dries. It is recommended that you treat your board with specially-designed cream or oil every so often, in order to keep it looking its best. Dimensions: 44cm (l) x 2cm (h) x 39cm (w).